I took a picture the day my life changed. The day I went from cheapest all-seasons available to much wider, stiiiiiicky 200tw summer tires. A thing of beauty, no? BONUS FEATURE: IS AESTHETICSINMOTION A STANCE BRO? Oh and the tires are slightly stretched. Funny story about that. 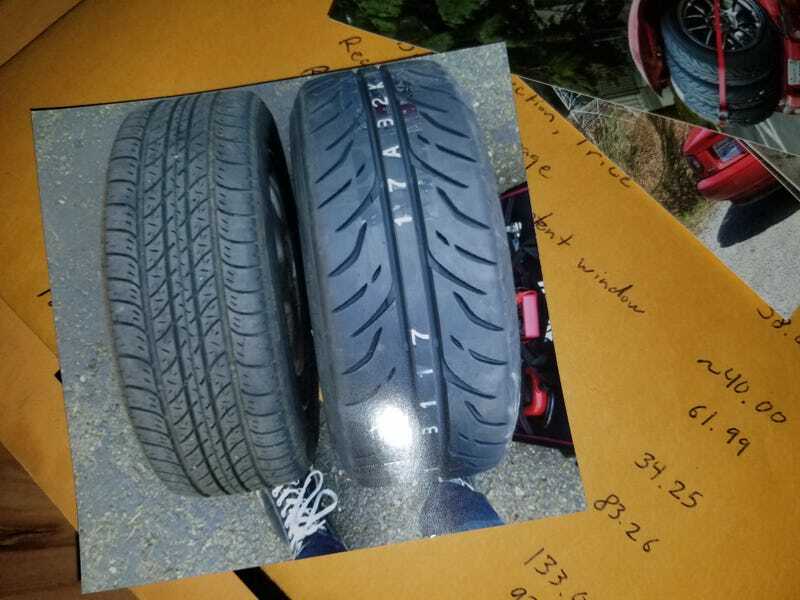 I originally ordered 205's and 15x7 wheels, to be mounted and balanced before arriving at my door. Flyin’ Miata ended up giving me the 205's on 15x8's instead (and charged me for 15x8's). I didn’t realize for months, but it was just one more in a long string of problems I’ve had with Flyin’ Miata. On one hand 15x8s are objectively better if I want maximum grip and speed, allowing me to get wider wheels and lower profile tires resulting in less sidewall flex. On the other hand...... 205's are narrower than you want to run on an 8 inch wheel so I’ve been living with a suboptimal setup due to an error on their end. Not really a big deal though. I’m not chasing lap times, so I think the only benefits to going up to 225 would be less road noise and potentially better wear patterns. I’m undecided if that’s worth leaving behind all the amazing 205/50-15 tires available.